Astrology is the study of the movement of the Sun, Moon and Planets against the backdrop of the Fixed Stars which we call the Zodiac, and the correspondence between this movement and events taking place on earth. As above so below. This ancient hermetic principle is the rationale for astrology which has been a sacred science for thousands of years. It relies on the observation of the way planetary cycles affect human behaviour based on the law of cause and effect and is therefore, scientific and empirical. However, as astrological interpretation depends on the astrologer’s higher faculty of intuition, it is also an art. A chart called a Horoscope is drawn giving the longitude position of the Sun, Moon and Planets in relation to the signs of the zodiac at the exact moment of a person's birth and their spatial position in a 12 house division of the horoscope according to the place of birth. 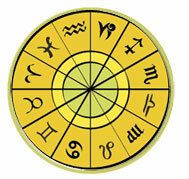 Astrologers study both the fixed and the changing aspects of life. While the birth horoscope shows a snapshot for a given moment in time and thus is static, the planets are constantly moving around the zodiac which gives a dynamic perspective. Astrologers will look at planetary cycles and the current movement of the planets in relation to the birth chart to give a personal forecast for the time ahead. With modern computers, it is a relatively simple matter to calculate the planetary positions and cast the charts. However, chart interpretation is highly skilled and may require several hours work. What is Vedic Astrology or Jyotish?